Watched by news reporters, a perfectly healthy, woman, perhaps in her early 20s was caught panhandling. As her workday began, she would dress up as an old woman and hobble on a pair of crutches. In fact, she was so bent over that her back was nearly parallel with the ground. As she walked, she carried a paper cup in her hand for collecting cash donations. By her appearance, pedestrians were quite convinced she was really handicapped. 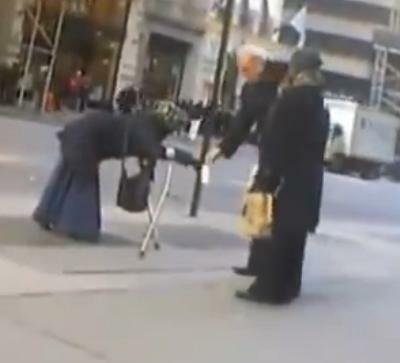 This woman hung out on streets such as 5th Avenue in downtown New York. She would only walk down avenues that contained eccentric stores as Gucci, Prada, Nieman Marcus, and Tiffany’s-locations where she knew that the more affluent and generous people shopped. She was secretly watched by a female news reporter for at least three days. When she was finished begging for the day, she would commute on a bus out to Queens. It was there where she parked her minivan and change into her normal clothes and then exited without the crutches. She dressed in nice clothes and wore Ugg boots. How did she respond to that? She simply ignored the reporter and continued walking down the street. Remember this story. Some bums are well-to-do people dressed up in costumes. When approached by such a person, don’t be so eager to give them money. If you see repeatedly see the same beggar hanging out in a specific location, this should raise a red flag. If this individual approaches you, tell them you observed them numerous times and you are suspicious of them. Suggest a place they can go for help. Find out these locations. If you’re able to snap a picture of with your cell phone, do so and submit it to local authorities. For those who commute to work and back using public transportation, you should not have to be approached by panhandlers every day. Downtown shoppers should also be able to shop without having to run into them. Not only do they annoy people, but they hurt businesses in areas they hang out in. By giving to a beggar, you’re only promoting such behavior.